Older communities are adorned with aged buildings. They provide more than nostalgia for historians. These buildings link to the community’s past and are often instantly recognizable landmarks to its residents. They run the risk of falling into disrepair—and eventually being lost forever. Or they can be restored and provide decades of additional service. Such was the case just outside of Pittsburgh, Pennsylvania in the bedroom community of Greensburg, where a building that had previously housed a Grand Rental Station equipment supplier lay vacant. John McCullough, an area native and entrepreneur, owns and operates several Ace Hardware stores and Husqvarna equipment dealerships, and was looking for the perfect location to open an Ace store in the Greensburg community. McCullough knew that location was vital to retail operations like his. 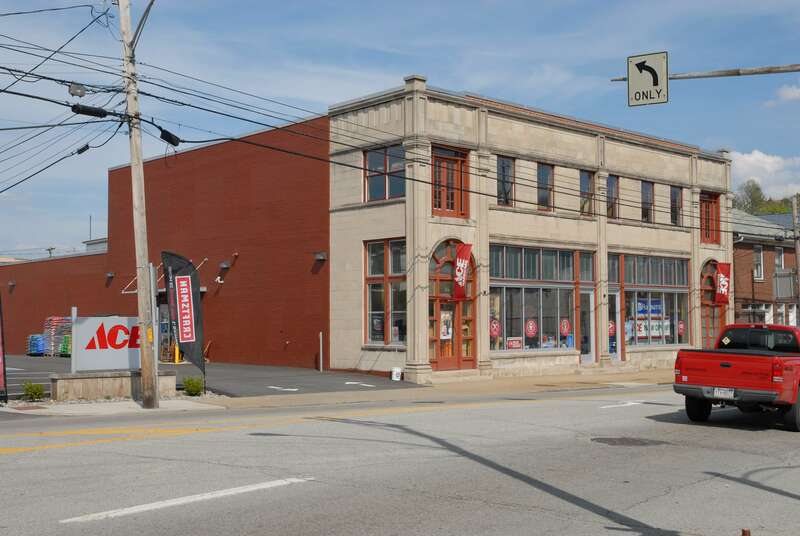 He sought a property that would provide adequate open space inside for store fixtures and an ample off-street parking lot in the downtown business district, which would provide the necessary passing foot and vehicle traffic to keep his doors open and his cash register ringing. Add that the property is also a well-known historic landmark, and it’s a veritable real estate gold mine. And that’s exactly what he found when he selected the vacant Grand Rental Station property on the town’s bustling main street. The building featured a large, open retail area perfect to display merchandise, and an existing parking lot to the side of the building. Although the original architecture at and above eye level was eye-catching, the majority of the floor surface was bare concrete. An automotive dealership and service facility for years, the building’s concrete floor was subjected to considerable exposure to oil, fuel, and other automotive fluids. Over time, these contaminants leached deep into the concrete. Owner John McCullough knew that as-is, the bare concrete floor would leave a sour taste in his customers’ mouths. He enlisted the expertise of locally owned J. Bazella Concrete Construction Company to select a hard-surface floor treatment that would work with the interior’s architecture and past use. Bazella’s recommendation? A liquid-applied, seamless color flake polyaspartic floor coating system from FLEXMAR® Coatings. What the concrete contractor knew is that FLEXMAR polyaspartics would offer superior performance in two ways. First, the coatings provide adhesion to concrete that is better than epoxies, acrylics, and other competitive coatings. Bazella knew that, with the absorption of automotive fluids into the concrete, an inferior coating system would not adhere and would lift, chip, peel, and stain if not all of the fluids were removed. Only the best polyaspartic coatings would adhere to the concrete and withstand stains from the contaminants. Second, FLEXMAR polyaspartics provide up to four times the durability of epoxies, acrylics, and other competitive coatings. This includes abrasion resistance, stain resistance, wear resistance, and hot-tire-pickup resistance. 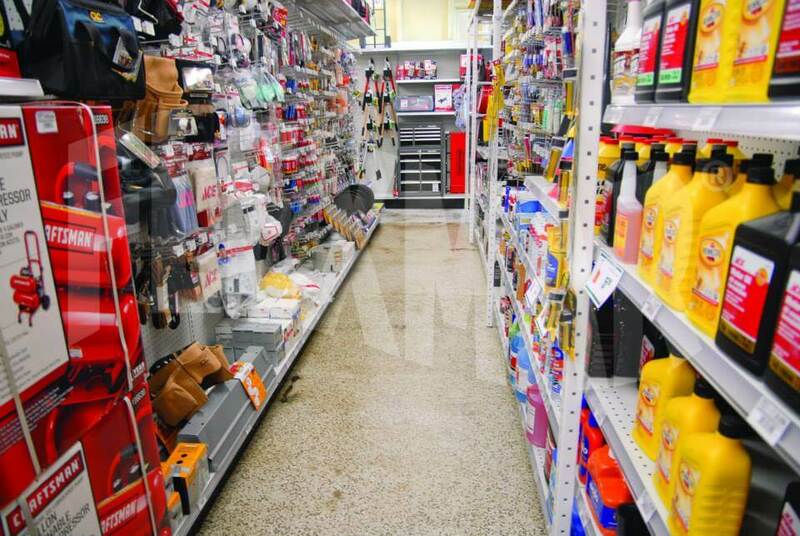 Hardware store flooring is under near-constant abuse from splash and spill exposure to chemicals, impacts from dropped tools and merchandise, tracked dirt and grime from foot traffic, and abrasion and heat from forklifts, carts, and other wheeled vehicles. Second-rate coatings systems would never endure these harsh conditions. Bazella knew that FLEXMAR polyaspartics would perform easily . . . and look great for years! What’s more, with the combination of FLEXMAR Sand Beige self-prime coating and Saddle Tan color flakes, FLEXMAR offered a way to closely match an area of existing cementitious terrazzo at the original storefront to provide a seamless look between old and new. 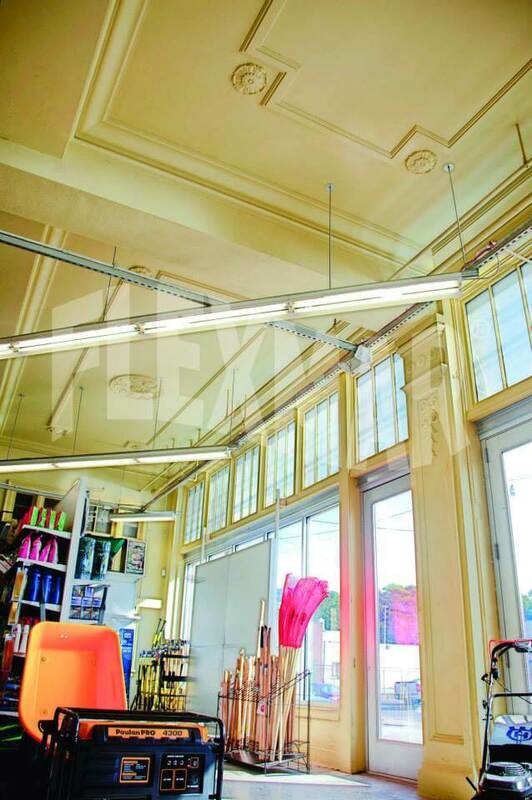 Finally, the store owner wanted to complete the renovation as quickly as possible so he could install fixtures, stock merchandise, and open his doors to customers. He didn’t have time to wait days while the floor in his retail area was out of service. FLEXMAR’s rapid re-coat and return to service had him confident that the applicators would be in and out within a day, not a week. The FLEXMAR-trained applicators at J. Bazella Concrete Construction teamed up with applicators from U-Neek Concrete Coatings and got right to work. They repaired chipped and cracked concrete with a rapid-set polyurea repair material. Then they diamond ground the existing concrete to create an optimal profile for the concrete to accept the polyaspartic coating. In addition, they spent a considerable amount of time using absorbent material to collect the oil, fuel, and other hydrocarbons that had been absorbed by the concrete over the years. Try as they might, not all of the fluids were removed. So they knew this job would put the adhesion properties of FLEXMAR polyaspartic coatings to the test. Once the concrete was prepared, the applicators rolled on a base coat of FLEXMAR Sand Beige Self-Prime HS coating and broadcast Saddle Tan color flakes into the still-wet base coat. In about an hour, the base coat was dry, and any excess vinyl chips were removed. Then, an initial coat of FLEXMAR Clear Coat HS polyaspartic sealer was rolled onto the floor. In about an hour, the floor was dry. Lastly, the crew applied the finish coat of FLEXMAR Clear Coat HS polyaspartic sealer. One hour later, the finished floor was dry and ready to be returned to service. The store opened for business in Summer, 2011. Since then, the FLEXMAR color flake polyaspartic floor has stood up to paint, rock salt, and other chemical spills, impacts from falling tools and merchandise, UV light exposure, heavy foot traffic, and machinery traffic. Despite the potential for wear and damage, the floor has continued to look brand new. In fact, the FLEXMAR Clear Coat HS polyaspartic sealer finish coats have given the floor a fresh, glossy look . . . even to this day! Even more impressively, there are no adhesion or stain problems in the areas where residual oils linger in the concrete. The FLEXMAR Coatings color flake system is holding fast, and the applicator is confident that no problems will arise for the life of the coating. Perhaps most striking is the difference in appearance and durability between the FLEXMAR polyaspartic floor and the cementitious terrazzo floor in the original store-front area. 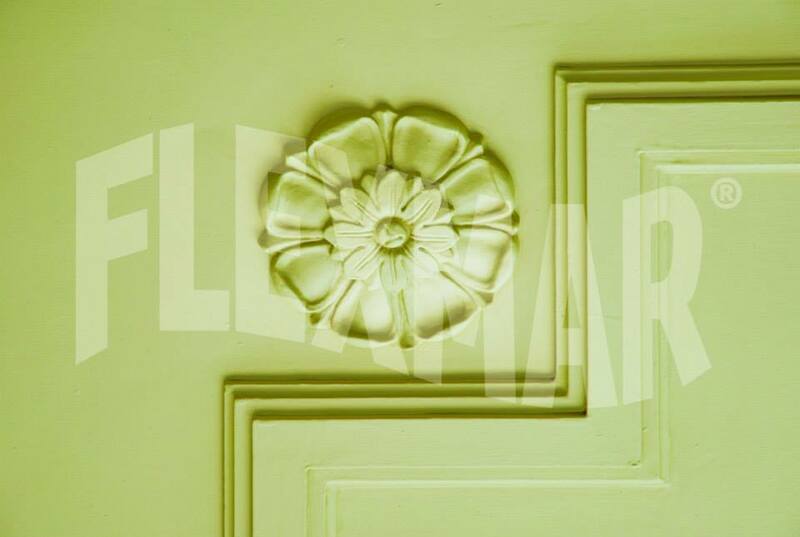 The FLEXMAR polyaspartic coating has maintained its original color without fading or yellowing and looks great with minimal maintenance. All that’s required is a regular dry sweep and wet mop as needed. The terrazzo portion of the floor, however, looks every bit its age, even with routine maintenance. The terrazzo has discolored over time, quickly shows dirt, grime, and stains, and requires stripping and re-sealing. But even with regular cleaning and re-sealing, the terrazzo floor is not as bright and inviting as the polyaspartic flooring. And that bright look has been key to the success of the Ace Hardware store. The high ceilings inherent to the aged architecture and narrower-than-usual aisles have the potential to darken the store and create a less-than-appealing ambiance for customers. 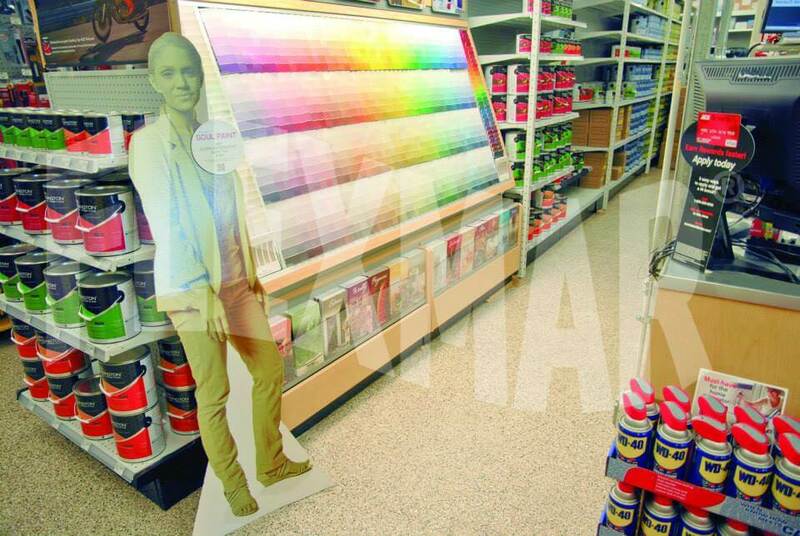 But the gloss and color of the FLEXMAR polyaspartic floor helps to reflect light and minimize any gloominess within the store, maintaining an inviting atmosphere. Durability and Appearance Aside . 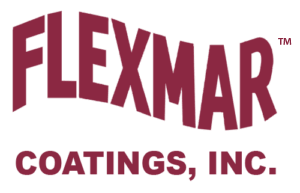 . .
One of the employees at the Greensburg Ace store, a decades-long veteran of retail work, reports an additional benefit to choosing FLEXMAR. He says that his chronic back pain vanished around the same time he started working at the Greensburg store. The employee attributes his recovery to the FLEXMAR polyaspartic floor. FLEXMAR has never tested for the presence of a cushioning property to our polyaspartics, but if people credit FLEXMAR Coatings for a more pleasant experience on their feet, we’ll take it! When John McCullough enlisted the services of Lee Calisti, principal architect at leeCALISTI architecture+design and assistant professor at the Carnegie Mellon University School of Architecture, they discovered that the newly acquired property was built as an automotive repair shop and dealership in 1926 and served as a Nash car dealership in the 1940s prior to its service as an equipment rental business. The prospect and challenge of renewing this building and breathing life back into the downtown lot was exciting for the owner and architect both. As demolition began the more modern alterations, they discovered ornate ceiling cornices, original plaster beams, and a mainly intact wood storefront. These features inspired Calisti to incorporate the historic with the modern. He commented, “Our concept was to celebrate the ‘hardware store’ aspect of the building’s new function while paying respect to the original structure.” That balance was monitored and endorsed by the community’s Historic and Architectural Review Board.